Last week’s top-gaining stocks on the TSXV were Millennial Lithium, SilverCrest Metals, Cobalt 27 Capital, Chesapeake Gold and Pieridae. Last Friday (January 25), the S&P/TSX Venture Composite Index (INDEXTSI:JX) rose 6.53 points, or 1.09 percent, to close at 603.20. Gold prices edged higher on Friday, supported by a weaker US dollar and political uncertainty. Meanwhile, base metals were on a downtrend for the week after US Commerce Secretary Wilbur Ross said on Thursday (January 24) that the US is still “miles and miles away” from a trade deal with China. Here’s a look at the 5 top weekly TSXV stocks. Millennial Lithium is focused on advancing two lithium projects in Argentina to a production decision, Pastos Grandes and Cauchari East. According to the company, Pastos Grandes has the potential to go into production within 2 years. Meanwhile at Cauchari East, Millennial Lithium is working towards permitting for drilling. On January 15, the company released a report showing that bench scale process test work completed on brine from its Pastos Grandes project in salta yielded battery grade lithium carbonate. 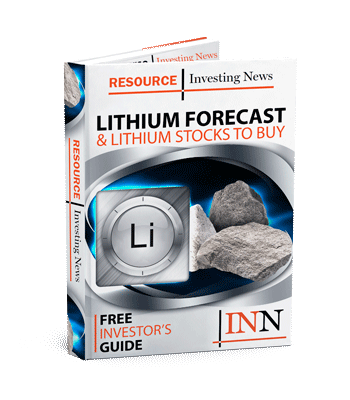 Shares of Millennial Lithium jumped 41.26 percent last week, closing at C$2.02. SilverCrest Metals is a precious metals exploration company based in Vancouver, focused on new discoveries, value-added acquisitions and targeting production in Mexico’s historic precious metals districts. The company, which did not release any news last week, is focused on the high-grade, historic Las Chiapas project. During the five-day period, shares of SilverCrest increased 15.25 percent, trading at C$4.61. Cobalt 27 Capital is a battery metals streaming company offering exposure to metals integral to key technologies of the electric vehicle and energy storage markets. The company owns 2,905.7 Mt of physical cobalt and a 32.6 percent cobalt stream on Vale’s Voisey’s Bay mine,‎ beginning in 2021. Cobalt 27 is also undertaking a friendly acquisition of Highlands Pacific, which is expected to add increased attributable nickel and cobalt production from the Ramu mine. On January 18, the company announced it had closed the royalties on the Flemington nickel-cobalt project and Nyngan scandium project in Australia. Shares of Cobalt 27 jumped 11.96 percent to end the week at C$4.40. Chesapeake is focused on the exploration and development of precious metals projects in North America. Chesapeake’s major project is its 100-percent owned Metates gold deposit located in Durango state, Mexico. During the five-day period, shares of Chesapeake increased 11.11 percent, trading at C$2.20. Calgary-based Pieridae is focused on the development of integrated energy-related activities, from the exploration and extraction of natural gas to the development, construction and operation of the Goldboro LNG facility for future production of LNG. Shares of Pieridae Energy increased 8.79 percent to end the week at C$2.60.